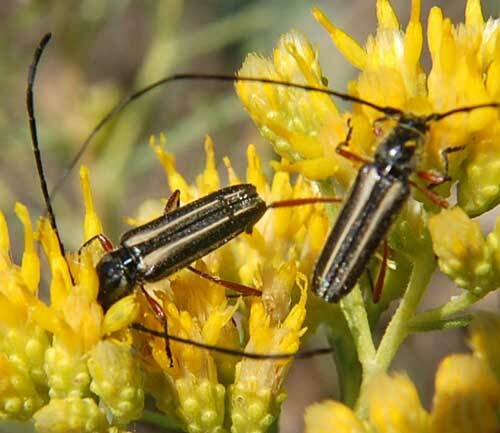 These beetles were observed on flowers of Alkali Goldenbush (Isocoma acradenia) near Bumble Bee, Yavapai Co., Arizona, USA. 30 Sept. 2008. 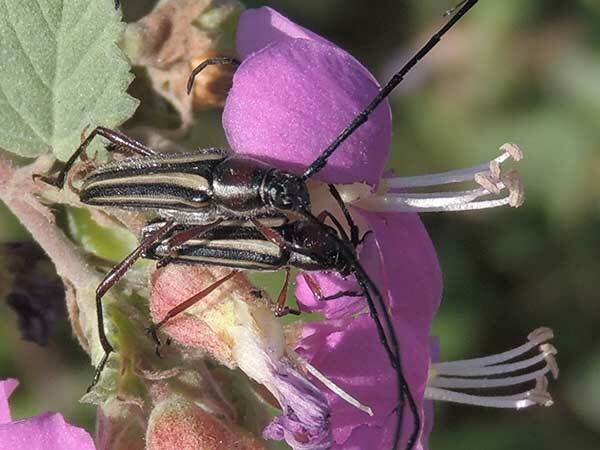 Long-horned Beetles begin their life cycle as a larva or grub after emerging from an egg that was deposited into a injured or dying branch. The growing larva tunnels through stems, branches or roots of plants. This species has been recorded as feeding within mesquite (Prosopis spp.) branches. It is possible that other woody plants are also used. This larval stage can last many months to over a year. Emerging adults are avid flower visitors and often fly to lights. The 'long horns' are the antennae. Males may use them in grappling with other males in tussles for mating rights. Adults of the Double-banded Bycid are most likely to be found late in the summer on flowers where they feed on nectar and pollen. This species ranges east into the Chihuahuan Desert of New Mexico and Texas and hence south into Mexico. This pair was found near the southern limits of the Sonoran Desert at Nacapule, Guaymas, Sonora, Mexico. 8 Sept. 2017. The flowers belong to Melochia.